Attention Men: Do you have a plan in place that will take your life to the next level? Men around the world are stepping-up to the RISE challenge this September 17th. Will you join us? 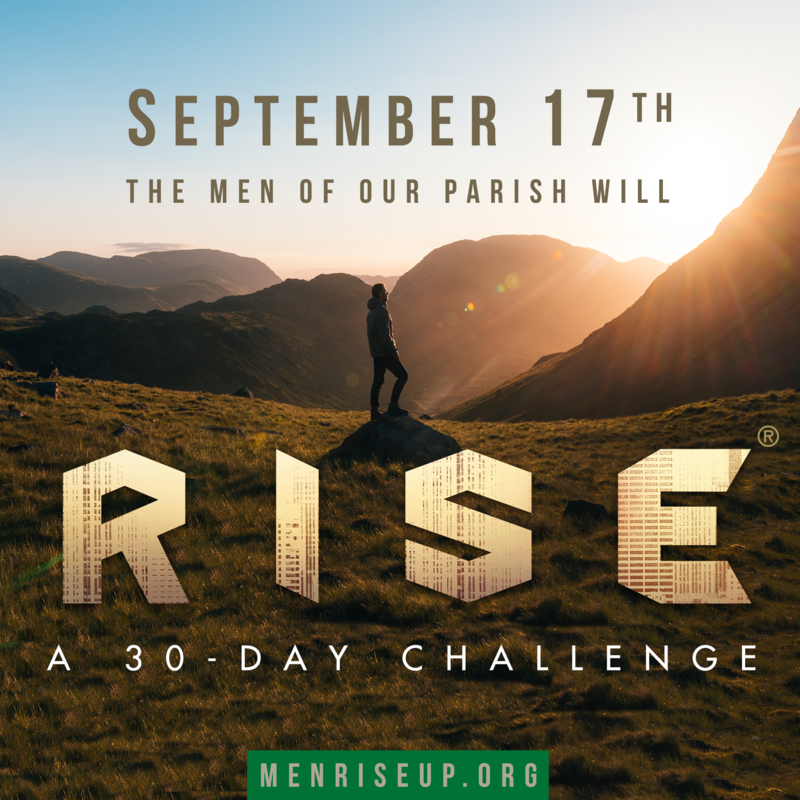 The RISE: 30 Day Challenge is a powerful video series that has changed the lives of thousands of men around the world. It’s delivered right to your email and only takes about 5 minutes each morning. The investment of $1/day in yourself and your family is priceless. Just register at MenRiseUp.org for the Sept. 17thstart-date. There are optional small group meeting each week. The Men’s Prayer group is hosting two sessions— 6:45 AM – 7:30 AM on Fridays, September 21, 28, October 5, 12 and 8:30 AM – 9:30 AM on Saturdays, September 22, 29, October 6, 13. Come each week or on the weeks you can to which ever session works best for your schedule that week. All men are invited to join in prayer and walk with a “brother” through the 30 day challenge. Deepen your knowledge of the Catholic faith. You are invited to share in a series of weekly faith formation articles. The goal of the series is to provide clarity to what the Church teaches, and to refresh and build a deeper appreciation of the Catholic faith. Click here to read or listen to the articles. The practice of retreats originated with Jesus. Jesus modeled the idea of stepping away from everyday life to deepen his relationship with the Father. He spent 40 days in the desert in prayer before he began his public ministry. Want to refocus on the Lord? 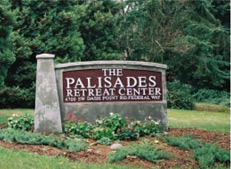 Check out the many retreats offered at the Archbishop Brunett Retreat and Faith Formation Center at the Palisades in Federal Way— a 20 minute drive from St. Pat’s. From silent retreats to retreats for young people, from retreats for only men or only women to retreats for fathers and sons or mothers and daughters to couples retreats— there is something that will help you disconnect from the pressures of everyday life and connect more deeply with God. An app for Catholic life, every day. 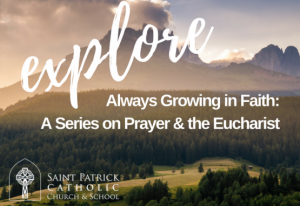 Connect with Saint Patrick Catholic Church & School like never before. Enjoy many useful faith-building resources and features to complement your daily faith life, such as, Confession and prayer time reminders, daily Mass readings, quick access to parish contacts, the ability to submit prayer requests, receive MassMode™ reminders to silence your phone before Mass, and much more. 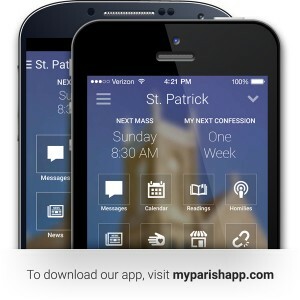 With myParish app you can receive and easily respond to messages from your parish, and RSVP for upcoming events. Truth & Life Audio Bible – the Bible will come to life. 5-day orientation program for new or nearly new diocesan leaders. In 2010, the Leadership Institute became an online program. Starting in 2012, the online Leadership Institute expanded again and is offered free of charge to all interested individuals. It continues to serve the needs of diocesan leaders and many of the webinars are also of interest to parish catechetical leaders and catechists, Catholic school principals and teachers, and other individuals who provide faith formation to diverse age groups and settings. The Leadership Institute Webinars are grouped by category or topic. Create your own curriculum by topics relevant to you. Best of all you can view them on your schedule!